The SPC Stress Control Biofeedback Card that changes color as you relax. 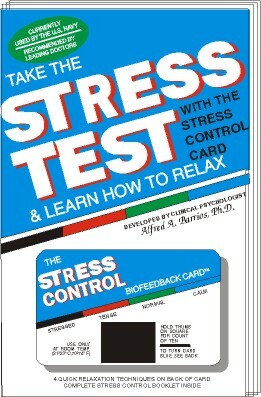 It should be emphasized from the start that SPC Stress Control Biofeedback Card is not just a stress test. It is also a stress control device. What color you register initially is not as significant as the fact that you can change the color by going through one of the highly effective quick relaxation techniques on the back of the card. Constantly challenging you to turn the card blue, you will literally not be able to keep your hands off the card  thus insuring continued practice of the relaxation techniques until soon the relaxation response becomes second nature. It makes relaxation training fun!